Our project involving privacy in social media focuses on studying the usability and implications of the design choices that developers make while building these systems. We look at widely used social networking platforms, especially ones that allow instant messaging, and study user behavior and attitudes on these platforms, and their socio-economic implications. To what degree does age affect privacy among users from marginalized populations? 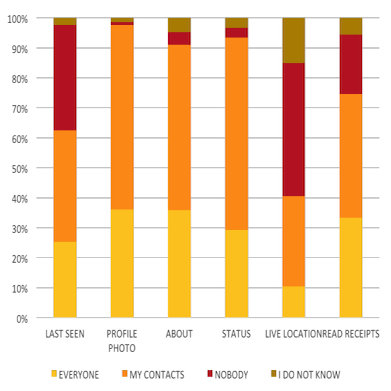 What are the different privacy preferences exhibited by people of various gender? To what extent does place of origin affect privacy preferences in WhatsApp, and how are they different from our knowledge of privacy attitudes in western populations? For more information about our specific papers, please visit our publication page.